Exploring the South Downs it’s not long before you come across dew ponds. Completely round, man made water reservoirs, they have been features of the area for hundreds of years as a source of water for cattle and sheep. Lined with chalk, they stand out in the landscape as a geometric anomaly in a similar way to a plantation of trees, whose serried ranks are often at odds with their wilder surroundings. 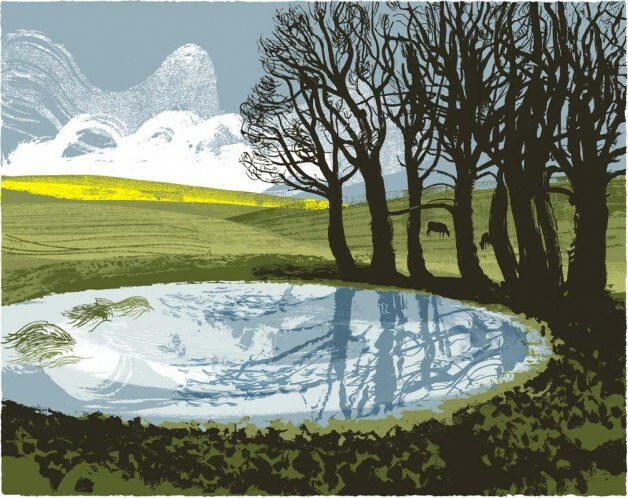 I came across this dew pond en route to Ditchling on a misty February morning. My first attempt to paint it was scuppered as drizzle set in and the image dripped off the paper. The next day was set fair and I came away with this.